Thank you for visiting this segment in the Creating A Cozy Christmas blog hop. I would like to thank Katie of Let's Add Sprinkles for putting this all together for us! I appreciate it greatly and am thrilled to be a part of this group of women from Texas! I don't know about you all, but I'm always looking for something a little different to give as a gift, especially when I want to give something home-made as opposed to store-bought. Today I'm sharing this cute little craft that I found on Pinterest. I thought it would be darling to put in a gift basket. Don't you just love Pinterest?! So many creative ideas...I'm glad those other people thought of all these cute things for me to make! If you have visited my blog in the past, you've seen the posts on my DIY adventures...some work out, some fail in a magnificent fashion! Fortunately, this cute little project was another one in the "score" department, and I'm all about something in my score column! ...and on the hubster's workbench. Finally, after the paint dried...did I say FINALLY...I was ready to get to the fun stuff. I took my stretchy ribbon, measured it, used a staple to secure the ends and slipped it over the lip of the pot. I cut a small square of the "Bling On a Roll" to be the belt buckle and used Elmer's Glue to attach it to the black ribbon. I purposely stayed away from that hot glue gun...just got my nails done and wanted to make sure they stayed intact! I used some baggies that I had on hand to hold the candy, tied it with the black ribbon and called it "done". 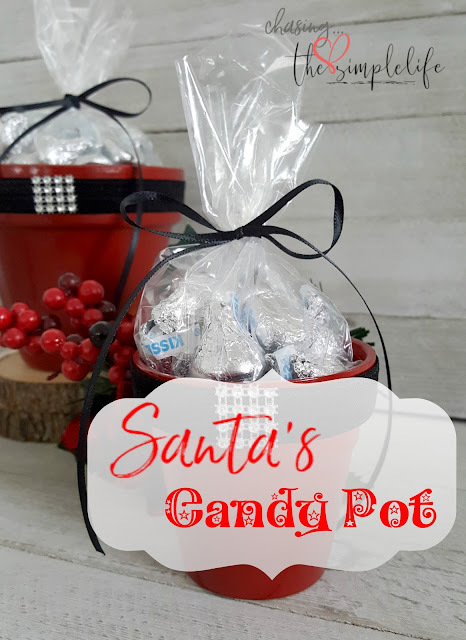 I loved this craft project...it was easy and the Santa Candy Pot will make a cute gift. Thank you so much for joining me! Please be sure to visit the other blogs listed below to see what Christmas goodies they have for you. Barbara at French Ethereal is next on the hop and is looking forward to seeing you! If something happens that you get lost along the way, you can always head back to the starting point at Katie's to pick up where you left off! Clever and so easy to do. Thank you for your inspiration. Thanks so much Kari! I appreciate it greatly! Have a great one! Thank you ma'am! I used to do crafting projects all the time when my kids were little, but with my grand so far away, I've gotten out of the habit. I need to try more little projects like this. I knew nothing about bling on a roll either...it's a big roll, so you will probably see it frequently in my posts...LOL Love and hugs sweet friend! Hi Benita! 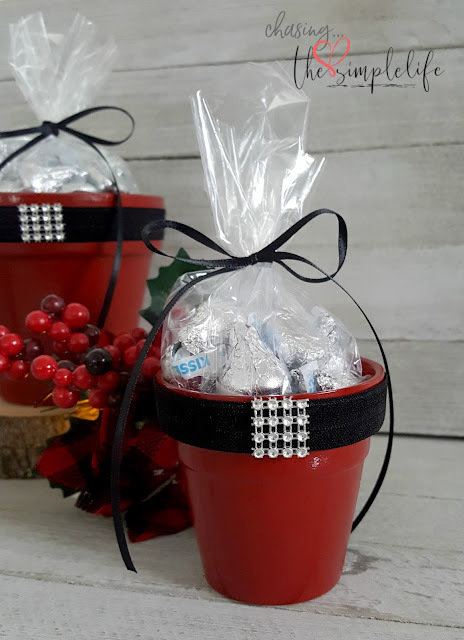 What a cute idea this Santa's pants candy pot!! Very clever with the sparkle buckle. <3 Thanks for sharing this this week as part of the Creating a Cozy Christmas blog hop. Happy to be on the tour with you! Barb, thank you so much! I enjoyed being in the tour with you ladies also! And thank you on the craft project! I like that you can put any type of candy in it and use any size pot...AND, that you can spray paint with different colors to get a different look! That "bling on a roll" will come in handy in the future! :-) Have a great one! Love and hugs! This Santa craft is SO cute and clever! Pinning away. Stay cozy! Thanks so much Laura! I love Pinterest for some inspiration! Have a great one! Betsy, thank you so much! I am going to make a few more using some different color paints…I think maybe gold for a little New Year’s gift! Have a great one! This is too adorable. I love it. I agree with you on the wind. I tried spray painting a Christmas tree! Thanks for joining our Creating a Cozy Christmas Blog Hop. Thank you so much! Yeah, spray painting in Texas is always iffy. I've got a few Christmas projects for posts that I need to get spray painted and this wind will just not die down...crazy weather! Thank you so much for pulling it all together for us...I enjoyed it very much! Have a great one! These are so cute. Have you seen the Herseys kisses that are santa hats! Just adorable. This is fun to see all of you Texas gals and your creative hearts. Have a great day. Thank you ma’am! YES, I love those and they are just precious!! 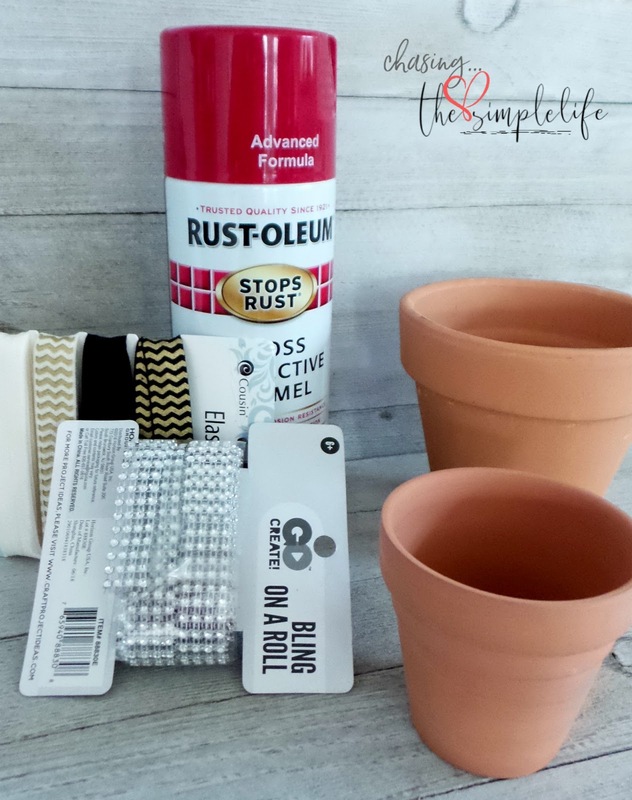 I’ve enjoyed this blog hop…forced me out of my DIY shell…LOL Hope you are having a great one Kris! Love to you my sweet friend! Benita, these are darling--I love the touch of glam the rhinestones add! Happy to be joining you on the hop and hope you have a blessed Christmas season, my friend! Thank you so much Cecilia! That little roll of bling was an awesome find…it’s a big roll, so I will be using it a lot…LOL I’ve enjoyed it greatly….it was fun to be with all of you ladies for this! Hope you have a great Christmas season also! Love and hugs to you! I love Pinterest too and whoever came up with it is a genius in my book. So many crafty people out there. But... I count you as one of them. These pots are adorable. Our neighbors will be so excited when they receive one. And of course, I'll give you all the kudos. Merry Christmas Benita! Oh, honey, I am right there with you…GENIUS! It is one of my favorite “go-tos” for almost anything! There are so many wonderful crafters out there and thank you for including me…but I have to go to others for my inspiration. They can look at a rock and see something like a paperweight or a tiara…all I see is a rock…LOL Awww, that is so sweet of you! 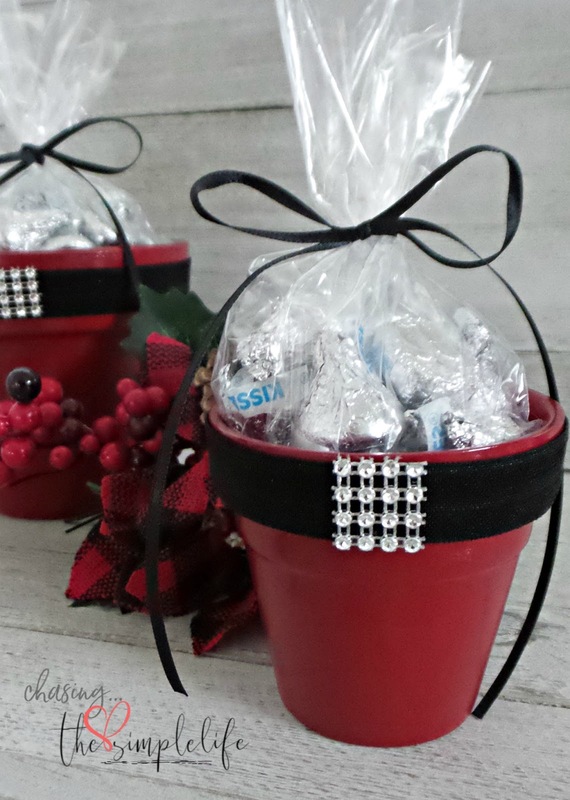 They will love it…I think these red pots would be pretty with the peppermint kisses that have the red/white striped paper on them. Merry Christmas to you sweet friend! I enjoy your blog so much! Love and hugs! Your little pots are adorable and will make welcomed gifts. I love it that your husband got in on the action too. Sarah, thank you so much! I thought they were adorable when I found them on Pinterest! Such a great place of inspiration! Yes, Edward always has to help me with something...LOL. Again, thank you and have a great holiday season! That is super cute and the Regal Red is a perfect, rich color of red. I was expecting a crazy crafting story, seeing as how the post was coming from you, lol. Kudos for not burning the house down! Rita, thank you so much! It was hard to choose the right color red…I had no idea there were 758 shades of red spray paint available…LOL I know, right??!!! LOL Surprisingly, this one worked. BUT, I do have a couple of others I want to try…there is no telling what will happen with them…with me, it is always a roll of the dice…LOL Love and hugs! Thank you so much! Sometimes, I impress myself…LOL When I decide to do a craft project, I always have to put it up against my Kindergarten Difficulty Scale…it doesn’t pass muster, off the table it goes…LOL Have a great one! Ho Ho Ho !! Well done my friend. 😊 Thank you so much sweet friend! With that spray paint, it could have been a total disaster, but Edward stepped in for me. I hit a snag with the glue, but was able to overcome…LOL Love and hugs! Your blinged out Santa pots are great! Merry Christmas. Thank you so much Eilis! Just an FYI, I’m still using your crinkle cookie recipe from a couple of years ago…it is perfect! Have a Merry Christmas! Adorable, my friend!!! I think you and I are alike in many ways....our patience for certain boring parts of projects is limited!! Thank you so much Debbie! You are exactly right! I’m that way with most everything…I want to hurry and see the result. Edward balances me out...he is the “let’s get through the process properly” sort of guy…LOL Love and hugs! Very cute! You are getting very crafty these days!! Thank you so much! I’m trying…I’ve got a few more things I want to try and then I will hang it up for a bit…the stress of a “flip or flop” is all just too much for me…LOL Love and hugs! Thank you so much Jan! Have a great one! Thank you so much! I love the easier projects and the ones that go quickly. 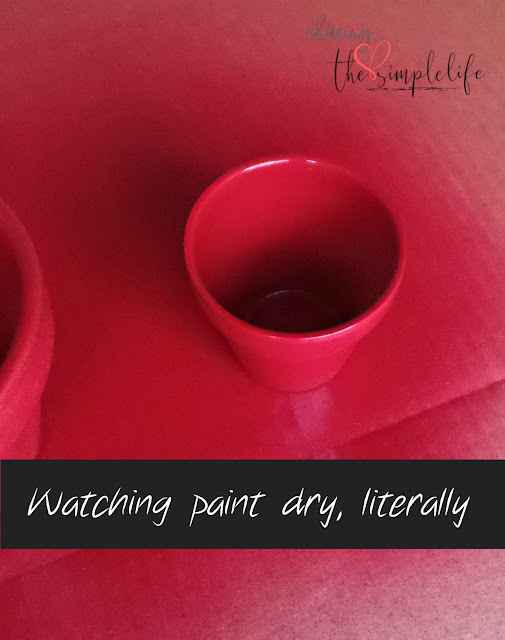 It’s always that way here with spray paint…now regular painting, I’m a pro—I won’t let the hubster touch a paintbrush! 😊 Love and hugs! Oh this is just too cute and would make such a great gift! I might make a pink one with bling for the little girls in my family! I am happy to be joining you on the Creating a Cozy Christmas blog hop! I hope you have a very Merry Christmas! I love stuff like this for gifts! And I think the pink would be perfect! I want to do gold and black for a little New Year's bling...the possibilities for colors are endless and with so many pretty wrappers on candy, it makes it even more so! Thanks so much! I enjoyed it greatly! Have a great one! I saw you on dear Dewena's blog. This is a great gift idea. I love RED at Christmas time. This little pot is cute, and the black ribbon and diamonds add a special touch. And who doesn't love chocolate Kisses? Such a special gift. Your Header name caught my eye, as I love to live life simply as well. Have a joyful Christmas season. Thank you so much Sheri! I love Dewena, she is such a special friend! And thank you so much for visiting! 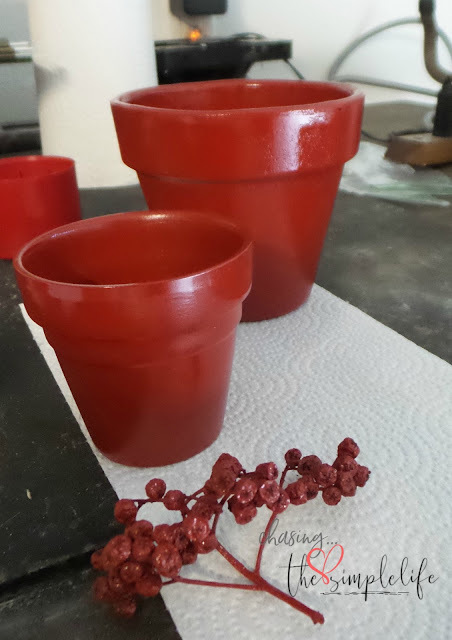 This little pots were so easy (I need relatively easy for my crafts…LOL). And you are exactly right…who doesn’t love those Kisses??!! And now they have so many flavors…the pots could literally be any color for a gift any time of year! Thank you again and have a wonderful Christmas and New Year!! This is so adorable! And easy! The perfect combination for crafts. Thank you so much! That is a combination I always prefer!! Have a great one!